~~ Baby and Wedding Showers: All the guests could write messages to include in a cookie. Then the parents or bride and groom could open them up to read aloud. Or they could save them to read at the baby's first birthday or on their first wedding anniversary. ~~ An Activity at a Kids' Birthday Party: The fortunes could be already printed or let the kids write their own. Then they could insert them into their own cookies. ~~ Christmas, Valentine's Day, St. Patrick's Day, etc: Use food color to dye the cookies red and green. ~~ Graduation and Retirement Parties: Write congratulation and best wishes messages. When you make your own fortune cookies, you can change the vanilla flavoring to another flavor of your choice, use food coloring to change their color, and even dip them in chocolate, caramel, or other coatings. Many times people get together to make cookies for the holidays. How about getting together to make fortune cookies? It takes a while to get the hang of it, but keep trying. Have your fortunes already written on papers about 4 inches long and a half-inch wide. NOTE: You can substitute any other flavoring for the vanilla extract, and add food coloring to the dough for holidays or special events. 1. Preheat the oven to 400 degrees F. and butter 2 cookie sheets or cover them with parchment paper. 2. Mix the egg white and vanilla until it's foamy but not stiff. 3. In another bowl, mix the flour, salt, and sugar, and blend all this into the egg whites and vanilla. 4. Place teaspoonfuls of the batter on one of the cookie sheets, placing them at least 4 inches apart. 5. Tilt the sheet to move the batter into round shapes about 3 inches in diameter. Be careful to make the batter as round and even as possible. 6. Don't make too many at a time because the cookies have to be really hot to be able to form them. Start with 2 or 3 to a sheet to begin with. 8. While one batch sheet is baking, prepare the other cookie sheet. 9. Remove the cookies from the oven when done, quickly move a cookie with a wide spatula and place it upside down on a flat surface. 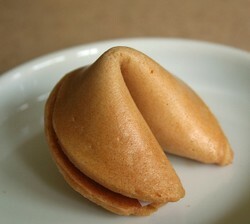 Quickly place the fortune on the cookie, fold it in the middle to close, and fold the cookie in half. 10. Place the folded edge across the rim of a cup and pull the pointed edges down, one on the inside of the cup and one on the outside. Place the folded cookie into the cup of a muffin tin or egg carton to hold its shape until it's firm. Quickly go back to the cookie sheet and fix the other cookies before they cool. NOTE: You can make a BLACK fortune cookie by mixing equal parts of red, blue and yellow food coloring. Test the color before using. Photo by MinivanNinja on flickr. Fortune cookies would be a hit at a graduation or retirement party. ~~ A smile is your personal welcome mat. ~~ Courage is the mastery of fear - not the absence of fear. ~~ Good luck is the result of good planning. ~~ Go confidently in the direction of your dreams. ~~ You are not illiterate. ~~ The one who snores will always fall asleep first. ~~ The secret of staying young is good health and lying about your age. Links to Funny Fortune Cookie sayings and Fortune Cookie messages. A great gift idea for anyone who loves to entertain. 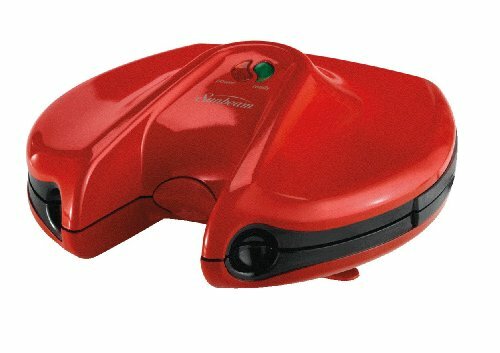 Bake 2 cookies at a time in just minutes. Simply pour the batter onto the round-shaped baking plates for accurate filling and close the lid. The fortune cookie maker's nonstick baking plates ensure effortless release. Place the hot cookie onto the folding tool, which bends to effortlessly transform the flat, round cookie into the traditional fortune cookie shape. Further customize the cookies by getting creative with the batter (think chocolate or strawberry), dipping them in white or dark chocolate, or frosting them and adding colorful sprinkles. 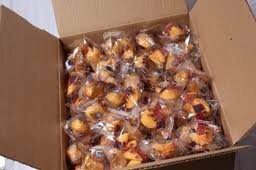 Most of the world's fortune cookies are made for the United States market. The largest fortune cookie manufacturer is Wonton Food Inc., which makes over 4.5 million cookies per day. With the generator you can write your own custom message and have it appear in a fortune cookie. You will be able to easily save it and share it with your favorite friend or family member! If your creative juices aren’t flowing at the moment, click on this page for pre-made fortune cookie sayings. Image and Fortune Cookie Generator from The Inspired Home website. Angela, wonderful post. Great tutorial! so much fun to make fortune cookies, and so easy. I had a recipe from the magazine same ingredients except they call for powdered sugar. They were very crispy. Merry Christmas Angela to you and your family. candy47 - It's easy to make fortune cookies, but a bit time-consuming because you can't make a whole batch at once like cookies. But they're fun and unusual. I didn't know it would be so easy to make fortune cookies. Thanks for the recipe! burntchestnut, Personalizing fortune cookies is a fun way, via happy fortunes, to spread cheer. I like the idea which you mentioned in your comment below about adding holiday aromas and flavors to homemade fortune cookies. RuthCox - that sounds good. I wonder if adding ginger, cloves or cinnamon would be good, too, especially around Christmas. It would be such fun to serve up homemade fortune cookies at holiday gatherings. I think I'd modify the recipe with beet juice for a tint of red and maybe cherry flavoring. Have You Ever Eaten a Horseshoe? What would you think if you saw a Horseshoe Sandwich on a restaurant menu? It's a common item in the Springfield, Illinois area.